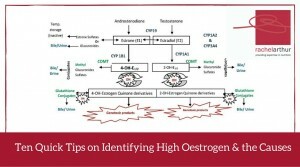 During mentoring sessions over the last week I’ve been prompted to ask a few practitioners if their patient had any signs, either clinically or in their pathology results, of high oestrogen. Each time it kind of caught the practitioner off guard because their patients weren’t presenting with conditions overtly related to an oestrogen excess and they hadn’t specifically ‘tested’ for this. However, in each instance the information was already there in the case, it was just a matter of knowing what markers to look for. So some patients scream ‘high oestrogen’ right from the minute they enter the room? But often others present with health problems that don’t necessarily appear related at first glance. Regardless, their condition absolutely could be being compounded by this background imbalance – think thyroid & other autoimmune conditions for example. There are plenty of patients who don’t have the exaggerated clinical presentation but still have this imbalance as a significant compounder or perpetuating issue in terms of their pathology. Relax – I am not suggesting salivary hormones or any form of expensive testing all round (!) – in fact what I am saying is before you even consider yet another pay out of pocket test, costing your patient more time and money, we should look to the clues that are already there, in standard blood tests. Amazingly, you can infer a lot not just about the overall oestrogenic load but also pick up some clues as well about where the excess might be coming from.